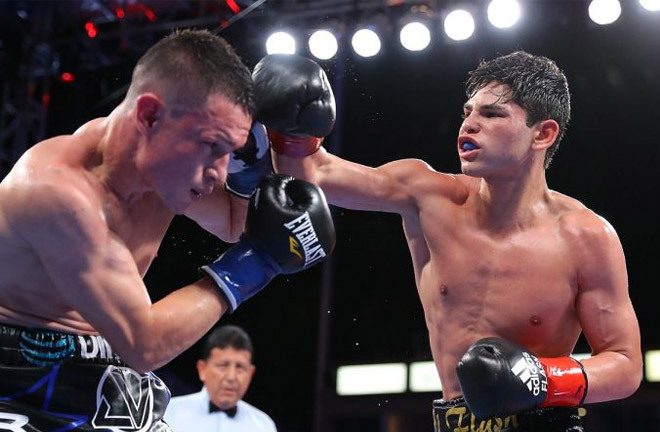 Junior lightweight Ryan “Kingry” Garcia is only 19 years old and just two years into his pro career, but has already made quite the impression. The undefeated super featherweight knockout artist (15-0, 13 KOs) is one of the more promising prospects out there and wants to prove that he is more than a hype job. Garcia, the 2017 ESPN.com prospect of the year, combines serious one-punch knockout power with sound boxing skills. The Southern California transplant has the swagger, boyish charm and punching prowess to be a potential crossover star someday, especially given his extensive use of social media. Golden Boy President Eric Gomez seems to agree. 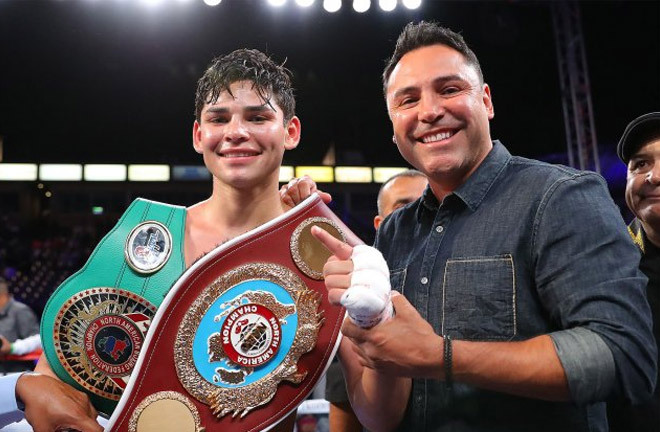 In fact, the powerful promotional firm believes in the Victorville-based fighter so much that they signed him to a multi-year deal in November 2016 when Garcia was only 17. His promotional debut took place one month later on the undercard of Bernard Hopkins’ farewell fight against Joe Smith Jr. at the Forum in Inglewood, California. Garcia started boxing at age 7 and trained extensively in his family garage, where he learned his craft. He initially fought almost exclusively in his native Mexico and barely missed competing in the 2016 Summer Games in Rio because he was too young at the time. Garcia went on to become a 15-time junior national champion, compiling an outstanding 215-15 amateur record. Garcia’s early boxing success has not come without a price though as he was forced to leave Adelanto High School to be homeschooled as his boxing career flourished. 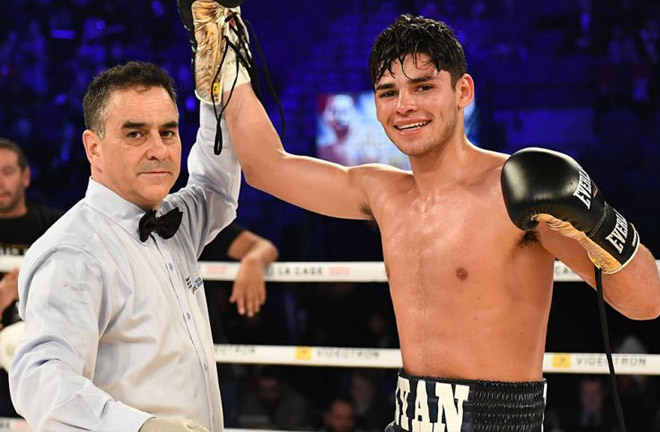 He turned pro in Tijuana before making his U.S. debut against Puerto Rican Jonathan Cruz and had already compiled a record of 6-0 with five knockouts before Golden Boy signed him. Thus far, Garcia has not disappointed in using his considerable amateur pedigree and skill set far beyond his years to make easy work of opponents under the Golden Boy banner. Garcia finally got his first real test against seasoned veteran and former featherweight title challenger Jayson Velez this past May on ESPN in Carson, California. The ultra-confident and sometimes cocky Garcia predicted a fourth round knockout but was instead extended past the eighth round for the first time in his career and had to settle for a decision win. Kingry still dominated the tough Velez by three scores of 99-91 for the unanimous decision victory in a fight that drew an impressive crowd of 6,625 at the StubHub Center. Garcia showed great hand speed throughout the entertaining bout and wobbled Velez with clean shots to the head in the third and fifth rounds. Velez (26-5-1, 18 KOs), 30, who was coming off a twelfth round destruction of former two-division titlist Juan Manuel Lopez, took Garcia’s best punches but had no answers for the talented young prospect’s offensive attacks. Going the distance was no doubt invaluable as Garcia continues to add to his arsenal. Ever the showman, the ambitious Garcia has been calling out reigning WBA super featherweight world champion Gervonta Davis (20-0, 19 KOs), saying that Tank should fight him now and not wait until he gets more experience. Garcia, who group up idolizing “Golden Boy” Oscar De La Hoya and Floyd “Money” Mayweather, Jr., has a flair for the dramatic. However, conventional wisdom suggests that Golden Boy would do well to keep their young charge far away from the heavy-handed Davis as they gradually step up his level of competition. The Velez win is encouraging and Garcia certainly has time on his side to develop (and grow his fan base) before a title shot opportunity presents itself. As of this posting, there is no future opponent. Next articleWho is Carlos Takam and what’s next?